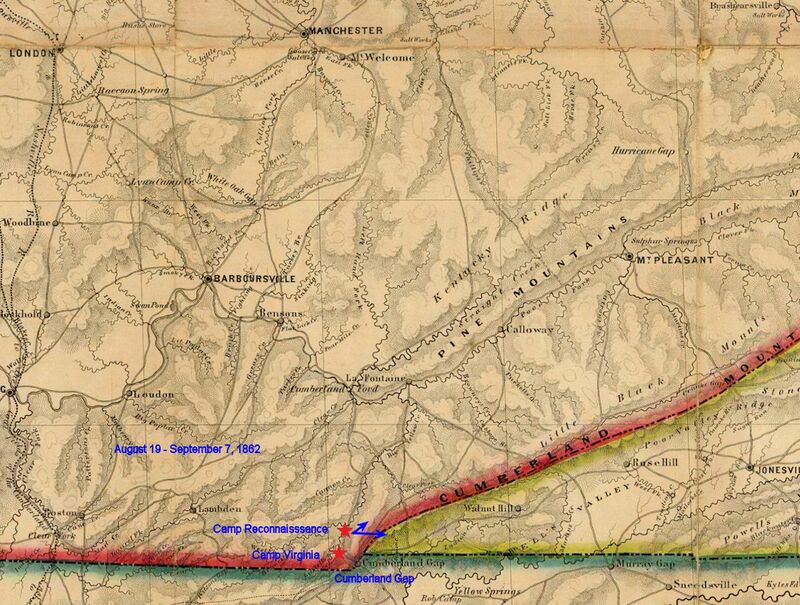 On this day the 16th Ohio, along with a cavalry unit under Mondy, went out on an expedition. They met a Rebel force and, according to Pvt. Newt Gorsuch, Company B, Drove them back killing several and [gathered?] 20 acres of corn belonging to a cecesh [secessionist] citizen , further mentioning that the 3rd Tennessee Infantry arrived from London, Kentucky. * Information and quotations from Civil War Diaries and Selected Letters of Robert Newton Gorsuch, recently published in book form by Newt Gorsuch's great grandson, Everett Gorsuch Smith, Jr. The book is available for purchase from various Internet sources. Period military map showing the approximate location of the 16th Ohio and Col. DeCourcey's brigade atop of the mountain ridges north of The Gap. Gen. Morgan had moved the brigade into this position to defend his main force holding The Gap from any approach by Gen. Kirby Smith's Confederate troops from the north. Additionally, Morgan was protecting what he had already likely planned as his Division's escape route in a few weeks if no relief came from the Union Army. The regiment was involved in several foraging missions, moving down into the valley, below, skirmishing with Rebel troops and collecting corn or any other food items they could scavenge from the land below their mountain stronghold.